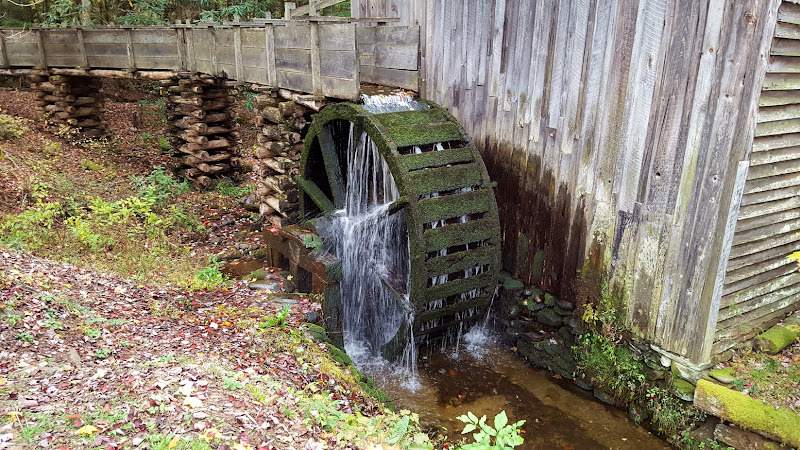 Fall Foliage 2015 - Cades Cove - Take a Hike! This past weekend, we went out to the Smokies for our annual Fall Foliage trip. Sandy and I left Friday after work and made the long drive out to the Cades Cove area of Great Smoky Mountains National Park. Our friends had arrived earlier and we set up at group camp site #4. After setting up camp, we went to bed early. Saturday morning, we woke up and got on the Cades Cove Scenic Loop Drive to enjoy the beautiful views as we made our way to the trailhead for our hike. 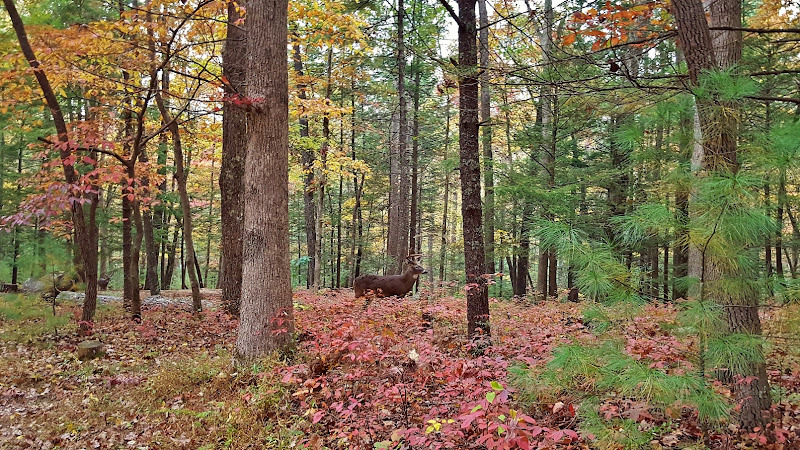 The one-way loop road runs around the Cades Cove area and provides great views of the valley and opportunities to spot wildlife and see the fall colors. Unfortunately, despite numerous pull-offs, most drivers seem to think it’s acceptable to stop in the middle of the road and block traffic to take pictures. We hit a traffic jam almost immediately upon getting on the road. Less than a mile down the road, there was a family of black bears in one of the clearings. As we slowly drove past, two cubs were up in a tree and the mother bear was foraging on the ground right next to the road. We drove a little further past and pulled over then ran back to get some pictures. By the time we got back, the mother had climbed up into the tree and the two cubs were foraging around on the ground. They were incredibly cute! They looked around for acorns and nuts to eat for a while, paying little attention to the hordes of people and cars going past. Then, the little cubs ran off into the woods. 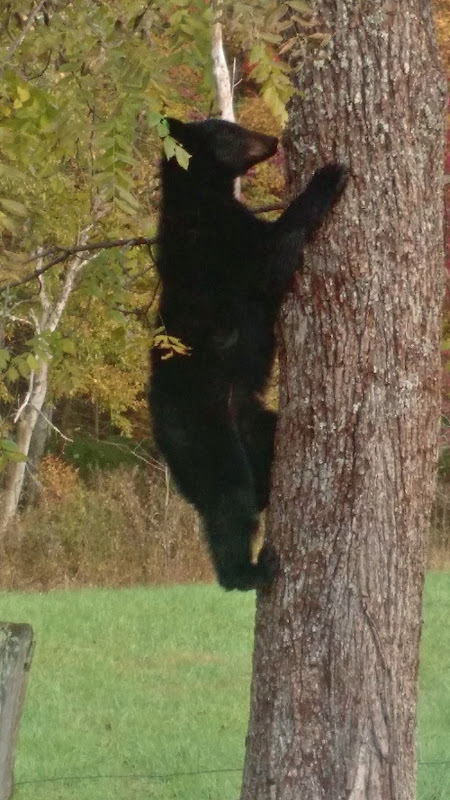 The mother bear then climbed down from the tree and ran across the field to catch up to her young in the woods. It was a very exciting wildlife spotting - I also got a video of the bear climbing down the tree. Once the bears were gone, we got back in the cars continued along the road. The fall colors were beautiful in the early morning light. We headed past the Cades Cove Visitor Center and got on Forge Creek Road. We followed this road to the end and parked at the trailhead for Gregory Ridge Trail. After getting out stuff together, we started hiking up the trail. It’s about 5.5 miles to the summit of Gregory Bald, gaining about 3000 feet of elevation. The first two miles are pretty flat, gaining only about 500 feet in elevation as the trail follows Forge Creek upstream. We crossed the creek a couple times on log bridges and then came to the Forge Creek campsite (#12) where we stopped for a snack. I was getting a little concerned that we had gained so little elevation in the first two miles and had so much more to gain before the hike was over. Sure enough, as soon as we left the campsite, the trail started getting steep as it headed up Gregory Ridge. The going was steep, but not so steep as to be unpleasant, and there were plenty of distractions along the way. Right past the campsite, we came to a spot with the most beautiful fall colors, at an elevation of about 2800 feet. We stopped for a while here for pictures and to enjoy the colors, then continued hiking up. Most of the rest of the hike was through a more forested area so there were no panoramic views. But throughout the hike, the foliage was spectacular. We saw some late-blooming aster along the trail. And further along, I saw some mushrooms, maybe Mica Caps, growing inside a cavity in a tree. In about 3 miles from the campsite, we came to the end of Gregory Ridge Trail and turned right on Gregory Bald Trail to make the last half-mile up to the summit. Gregory Bald is a grassy bald, so the views are much better than most of the Appalachian peaks, which are covered with dense forest. We could see the open areas of Cades Cove far below in the distance. Although it’s a natural bald, the National Park Service maintains it to keep it bald. It was cloudy, which diminished the views a bit and even drizzled a little bit when we got to the top. We found some trees to seek shelter from the rain while we ate lunch and then wandered around a bit to get some pictures. Once we were done, we made the hike back down the mountain. It was all downhill, so it went a lot faster on the return. In about 2 hours, we made it back down to the base and then starting driving back towards the scenic loop drive. Along the way, we made a quick stop at Henry Whitehead Cabin along Forge Creek Road for a quick picture. Then we continued to the Visitor Center. While Sandy shopped for a bit, I walked around and got some pictures of the historic old houses and mill. From here, we got back on Cades Cove Loop Road, finishing up the very slow drive and then left the park and headed into Townsend. We had a good barbecue dinner at Smokin’ Joes and then went back to camp. We built a campfire and socialized around the fire before retiring for the evening. Sunday morning, we broke camp and left around 830. We wanted to get on the road early as we had a long drive home. Before we made it out of the campground, however, we had to stop for a buck walking across the road. Outside of camp, we took Little River Road towards Gatlinburg. We made a quick stop at Meigs Falls at the point where Meigs Creek flows into Little River. After this, we continued through Gatlinburg to Cosby and got on the Foothills Parkway to I-40. We made a quick stop at a couple of the overlooks for some last fall foliage pictures in Tennessee before getting on the interstate and heading east. Just past Asheville, we got off the interstate and took the Blue Ridge Parkway north a few miles to the Folk Art Center. After getting our stuff together, we started off hiking northbound on the Mountains-to-Sea Trail, planning to check out the Folk Art Center when we returned. The trail starts following an interpretive trail around the center and then continues north following closely to the Blue Ridge Parkway. In less than a mile, the trail crossed the parkway and we hiked along the other side. Although the leaves were changing along the trail, there weren’t many great overlooks to view the fall foliage. In about 2 miles from the start, we found a short path that led to a cliff face over the parkway with great views of the hills and suburbs of Asheville. Here were the great views we had been looking for – the foliage and views from the cliff were just spectacular. Down below was an overlook on the parkway, but our view from the cliffs was even better. We stopped here for a few minutes to enjoy the view and get some pictures. Then we continued on the trail for another half-hour or so, turning around after we had hiked about 3 miles. As we were returning, we saw a couple other groups of people on the trail and recommended the side path to the cliff for the best views. Near the start, we some some bushes whose leaves had changed to a bright pink. Once back at the Folk Art Center, Sandy and I browsed for a little while. They had some really nice stuff, but it was very expensive, so we didn’t get anything. From here, we started making our way towards home. Before getting back on the interstate, we stopped at a produce shack to get some apples. And of course we had to stop at Las Salsas in Morganton on the way home for dinner. The rest of our friends had arrived at about the same time so we ate with them. As we were getting ready to leave, we saw Casey and LeAnna, having stopped on the way back from Linville Gorge. At that point, I think there were people from Raleigh than Morganton in the restaurant. After a delicious dinner of fajitas, we made the drive home.